Piracy isn’t committed on the high seas anymore, but on the Web. The Stop Online Piracy Act, or SOPA as it is known online, is an anti-piracy bill that proposes a law that would enable an owner of a certain piece of intellectual property to issue a court order to the domain host, warning that a certain website, if determined by the owner to be primarily made for copyright infringement, can and will be shut down. The court order can also block the site from search engines and advertising services. 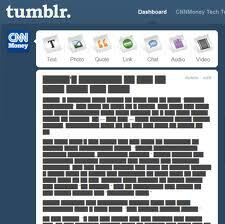 Late in 2011 microblogging giant Tumblr blacked out all text and images on their microblogs. a penalty of up to five years imprisonment for ten infractions within ten months. The fact that the potential take-down of websites could happen without due process has made many users very nervous. The wording of the bill is vague, leaving the question of what exactly makes a website copyright infringing open for interpretation. Some of Penn Manor’s community could weigh in on the subject of the proposed bill, “I think it was originally created for music and film, but it’s now more of a blanket law that covers more than they understand,” said Diane Bounds. Users attempting to view Google's homepage on January 18 would be met by a black bar. This bill has generated a firestorm of criticism from many of the giants of the Internet, for instance, Wikipedia. Wikipedia chose January 18 to file its protest. 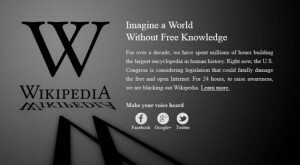 Users wishing to know the capital of Colombia that day would be redirected to this message: “Imagine a World Without Free Knowledge” Wikipedia is protesting both the PROTECT-IP act and the SOPA bill, blacking out it’s entire website, only allowing the articles directly related to the contested bills to be viewed. As they always do, however, users of the information giant had already found the workarounds to the redirection and have circulated them online for those who really, really needed to use Wikipedia. And they aren’t the only ones. Technology news site Wired.com also blacked out its headlines and images, though the black out wasn’t complete as when the user’s cursor hovers over the headline or image the blackout disappears. The Electronic Frontier Foundation, the web browser Firefox, and WordPress all have ongoing petitions and blacked out headings. The webcomic series xkcd, The Oatmeal, and Saturday Morning Breakfast Cereal also had blacked out their comics for January 18. The response to Tumblr’s online petition was overwhelming. Microblogging platform Tumblr blocked out it’s entire site in late November 2011. 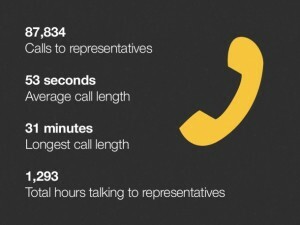 According to Tumblr, the petition garnered 87,834 phone calls to local representatives, the longest being 31 minutes long. Google, instead of commemorating the birth of a famous author or artist, had chosen to make their image on January 18 to be simply a black bar. 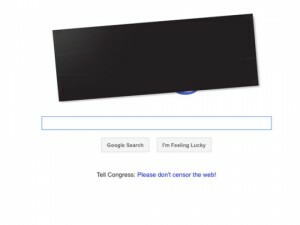 If the user should click on the black bar on the homepage, it links to a blog post asking users to sign their online petition against SOPA and its partner bill, the Protect-IP Act. Not everyone was impressed by the Internet protests, however. “Some technology business interests are resorting to stunts that punish their users or turn them into their corporate pawns, rather than coming to the table to find solutions to a problem that all now seem to agree is very real and damaging,” said Senator Chris Dodd, the chairman of the Motion Picture Association of America in an article by the BBC. Dodd is a good example of the parties in support of the bill: the MPAA, U.S. Chamber of Commerce, and major pharmaceutical companies are all major proponents of SOPA. The intention of the bill is not some apocalyptic doom for the Internet, but to protect intellectual property and keep theft away. What supporters of this bill fail to realize, however, is if the bill passes, the wrong people will be affected. The law would shut down pirates domain names, but not their IP address, so it would be as easy as setting up a new domain to continue stealing data. It is relatively easy for a website to set up mirror sites — or identical copies of the original site. During the height of the Wikileaks controversy, the leak site had almost 1300 mirror sites. Congress held hearings on November 16 and December 15, 2011, but much has changed since then. On January 18 alone at least four senators in support of PIPA withdrew their support for the bill, releasing assorted statements agreeing that a bill carrying as much power as SOPA/PIPA does, needs to be revised. Users attempting to log on Wikipedia to deface the article on Ernest Hemingway would be unpleasantly surprised. Since Congress’s latest talks, there has even been new suggestions on how to limit piracy. The OPEN act, drafted by Senator Ron Wyden, would instead take an alternative approach that is exactly as its name suggests, leaving the internet open to the public. Although it is far from perfect, it seems the OPEN act is much more plausible than it’s overly extreme counter-parts. In fact, the PROTECT-IP act is actually a rewrite of a bill sent to Congress earlier in the year, COICA or the Combating Online Infringement and Counterfeits Act . The discussion on the Stop Online Piracy Act is set to resume February 2012. The PROTECT- IP Act will be voted on January 24, 2012. With such a controversial bill, it’s hard to guess what may exactly come out of it, but whatever decision they make, let’s hope that it’s the one the people of the Internet want. Heard a lot of drama over this in the first few days it kicked off; seeing the Wikipedia blackout and Google’s censor protest in unison with eachother was a bit inspiring. It’s nice to see that Internet users (as well as the Internet Superpowers that service them) have the grapes to stand up and throw a middle finger toward the Government when they start overstepping their duties.